Taco nights are standard in our households, and thanks to this make-ahead breakfast burrito idea by Iowa Girl Eats, all those mexi-ingredients don’t need to go to waste. 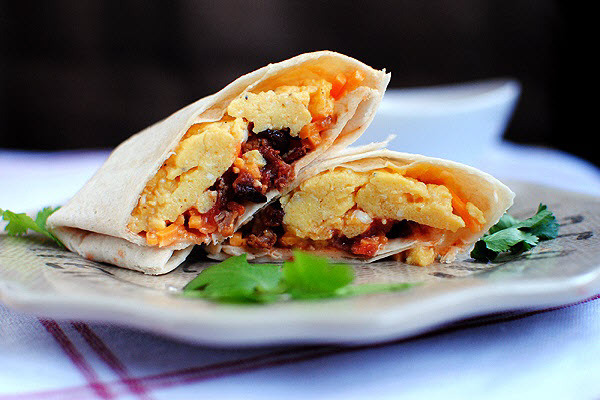 Re-purpose your leftover tortillas, salsa and cheese into freezer-ready breakfast burritos. With the switch up of eggs and bacon, and 30 minutes on a Sunday night, you can have a brekky that only takes 90 seconds of your busy morning to heat and serve. Olé! Do the kids have a special day ahead of them? 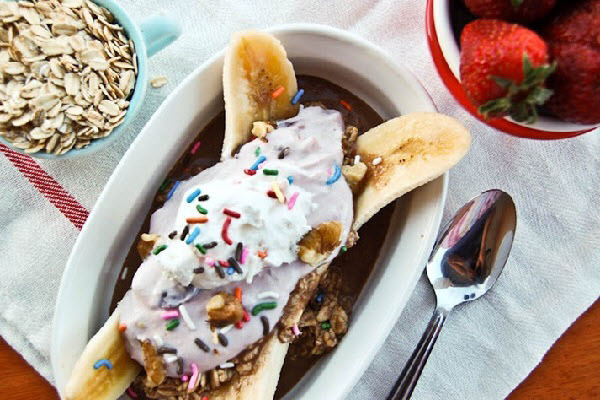 Surprise them with this tasty banana split breakfast idea by Steph’s Bite by Bite. They won't even suspect it’s a healthy version of the ice cream classic. Bananas, rolled oats, almond milk and cherry yogurt make up the base, and the usual sprinkles and whip are a familiar finish. ...to the ever-tasty avocado! 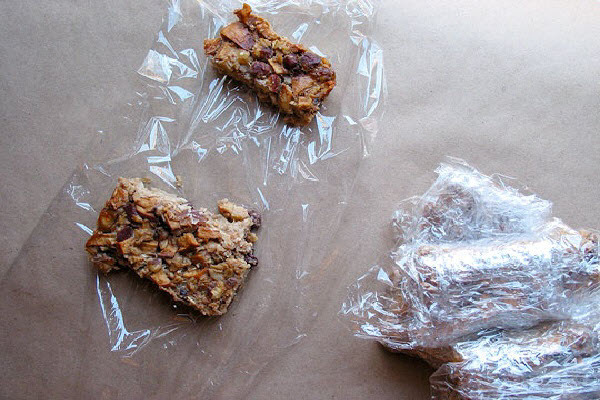 This idea by Hello Lately is a great way to take breakfast on the road. 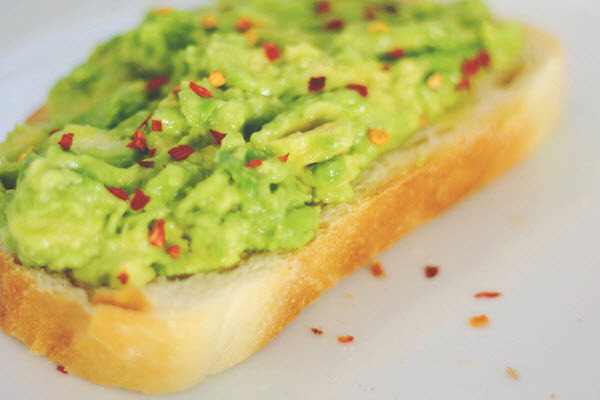 Sourdough toast is topped with mashed avocado seasoned with a dash of lemon juice, olive oil, salt and red pepper flakes for a bit of a kick. Don't cry, plain toast — we still love you. No more excuses for skipping breakfast. 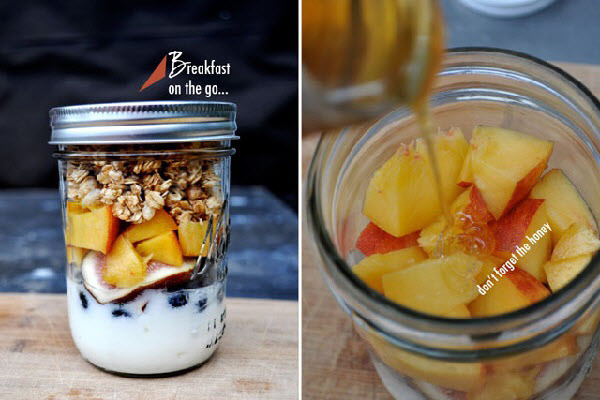 Make a 12-pack of these yogurt jars by I Art U on the weekend, and the family’s parfait lovers are set for the week. The combos are up to you. Layer Greek yogurt with seasonal fruit, honey and granola on top (to maintain crunch). 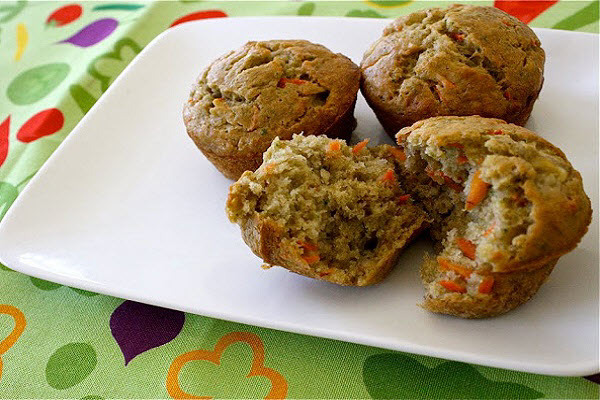 With the array of grocery-store treats posing as breakfast, these veggie muffins by Dana Made It provide real nutrients courtesy of bananas, carrots, broccoli, yogurt and prune juice. And the cupcake shape helps with the veggie disguise. The beauty of these oatmeal bars featured on The Kitchn is that you can freeze your batches into individual portions to enjoy at your own pace. A perfect busy-morning breakfast — just thaw and reheat. With oats, raisins, fruit and nuts, these scrummy bars will tide your crew over until lunchtime. 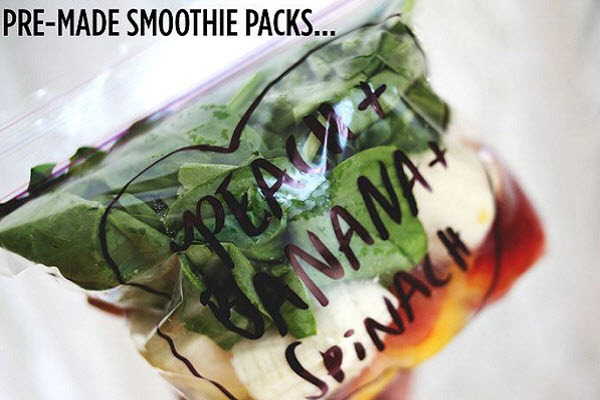 Capture the flavor of all of the in-season fruits and veggies using this idea by A Beautiful Mess for pre-made smoothie bags. Assemble your fave combos and freeze them for future use. Check out the full post for some inspiration! 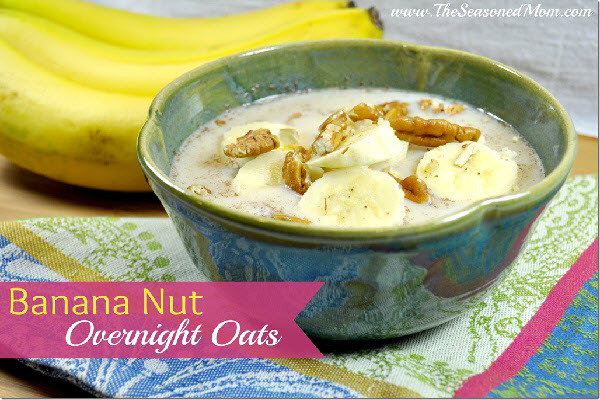 The Seasoned Mom turns to these banana-nut oats for a quick and easy meal full of whole grains, protein, healthy fats and calcium. The oats soak in milk or yogurt overnight, and then are topped with fruit and nuts in the morning. Such a simple and nutritious breakfast! 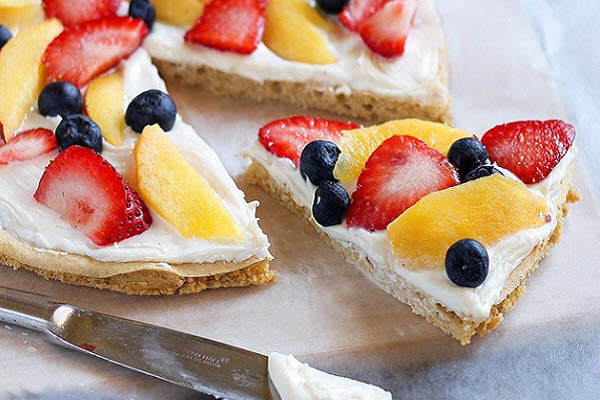 This idea for breakfast pizza by Chocolate Covered Katie ticks all of the boxes needed to be a kid favorite: pizza-shaped, a little sweet, and with build-your-own flair. The kids will love a quick pizza assembly line in the morning. Make the “crust” ahead of time to speed things up. Why is anything made in a muffin tin instantly cuter and more delicious? 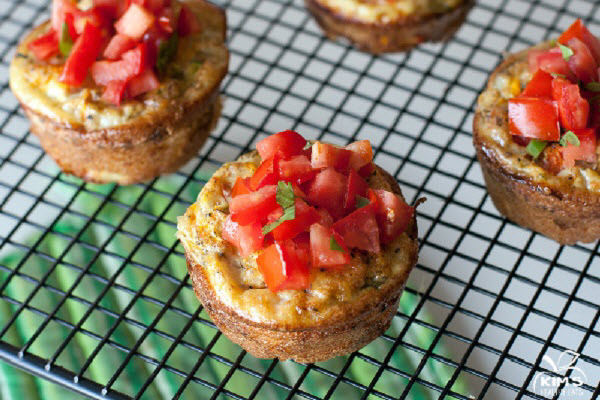 These mini zucchini and feta frittatas by Kim’s Healthy Eats are no exception. What’s even better is the time you’ll save in the morning. Leave the scrambling (eggs, that is) to a less hectic time like the night before or over the weekend.